The building structure is carefully thought through and tested over time. We have installed over 1,100 studios in the past 20 years all over Ireland and the UK. From Bere Island in West Cork to Malin Head in Donegal, our products have been tried and tested in the harshest settings over long periods of time. When you buy from Shomera, you buy reputation, expertise, design excellence and a sustained passion for delivering great buildings that look beautiful and work for you, 365 days a year. We use in-situ poured concrete pads (foundation holes are dug and concrete is poured to levels) and treated steel beams. 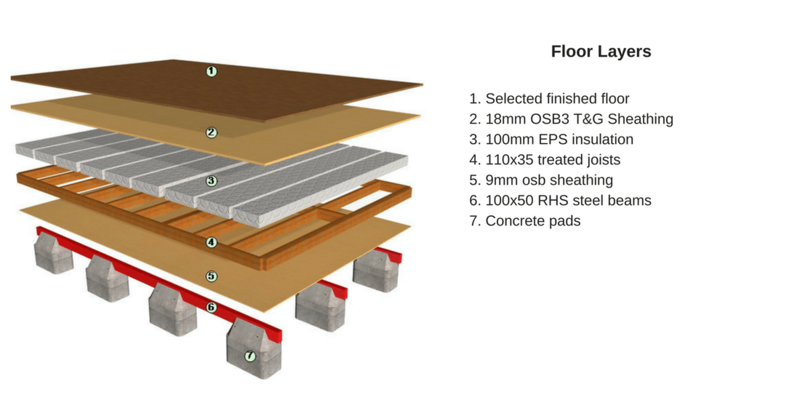 The steel beams provide structural support (giving a solid feel underfoot) and a damp-proof medium. We do not recommend the use of concrete blocks or other porous concrete products against the floor sections. Even with a good DPM there is vulnerability to transmission of damp and mould growth. 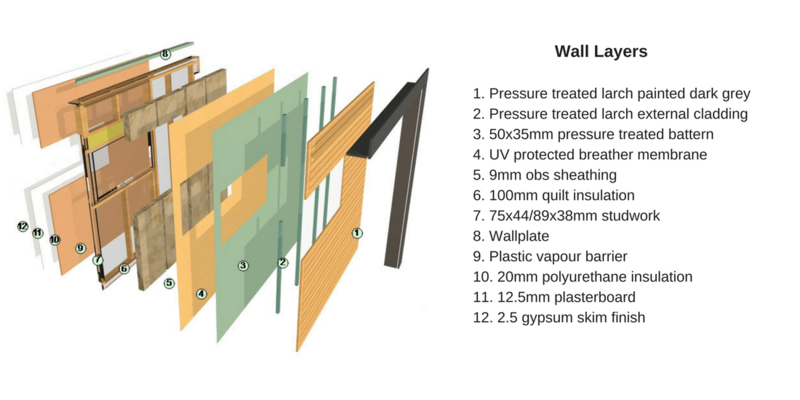 Using structural timber frame timbers (all certified and kiln-dried) the wall have 10 layers to provide the optimum in terms of look, weathering, longevity and warmth. The most important function of a roof is to provide trouble-free weathering. Consequently, we have chosen a fibreglass material which is what we use on our extensions and have used on hundreds of roofs in the past 10 years. The windows and doors we use are double-glazed uPVC. We have chosen the material uPVC as the best balance between cost and performance. uPVC windows provide a high degree of performance and warmth. While aluminium windows are structurally very good and have a thermal break detail, aluminium remains a highly conductive material and compromises performance. Just touch an aluminium window and you will feel how cold it is. 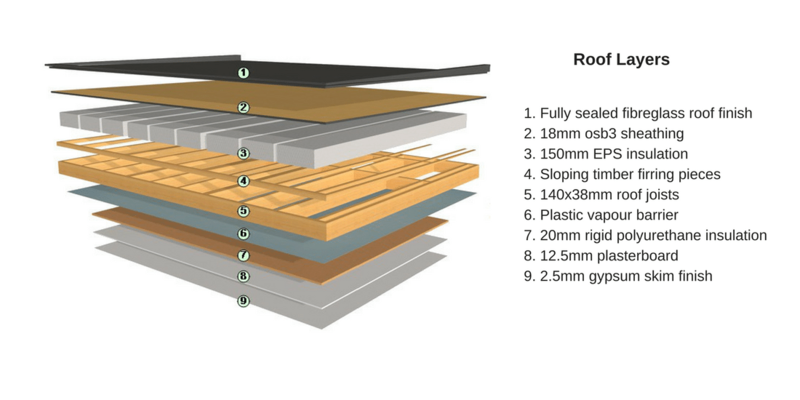 We use a combination of insulating materials to achieve the optimal performance for our garden rooms. On the ceilings and floors we use rigid EPS to avoid adverse effects of weather during installation. Rigid insulations have a higher U value (U value measures heat transfer and loss) but the critical issue is how well it is fitted. If you use a high-value, rigid insulation but have any gaps (even millimetres) between the material and structure, the effective performance is dramatically reduced. That is why we fit our insulation in our factory under controlled conditions. The fitting process includes using expanding foam adhere the insulation to the frame and to close all gaps. On the walls we use a combination of high-quality quilt material (non-slumping) and a continuous layer of rigid insulation on the inside skin. The quilt material is protected by a layer of visqueen plastic with cloth tape and the combination of these materials means the studio will heat quickly and hold temperature for longer. Having used many different claddings over the years and given our feedback from customers, we have chosen larch as our preferred timber cladding. It offers a great balance between aesthetic and performance. In other words, it looks great, lasts for generations and doesn’t have to be painted often. Our customers comment that the shadow gap detail is a particularly attractive detail. On the elevations where the garden room is against a boundary we recommend use of a cement board because it does not require upkeep or maintenance. Some of our customers decide to paint the parts of the cement board that are visible while leaving the area below the fence-line untouched.